as Madonna sing, today the Girl gone wild with her make up! Serena suggest you a strong look, for brave women only. I try to contrast this wild make up with a minimalist outfit, without forget the topic of this week…. Stripes! 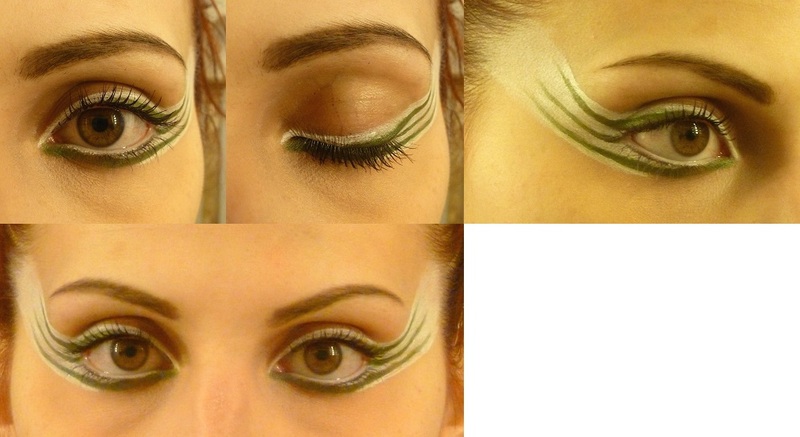 Eyes: apply a khaki eye shadow or Supracolor cream product (using for theatricals), draw three lines: one under the eyelid, one from the outer part of the eye and the final one that takes the final part of the usual beading and making them stretched out by an imaginary boundaries marked at the end of the eyebrows. Fill in the blanks of the lines made with white Supracolor and fade it until touching the root of the hair. Draw a thin white line at the ends (top and bottom), as you can see in the pictures belowed. White make up also goes in the first part of the normal beading. Apply white pencil inside the eyelid to enlarge and light up the eye. Apply a brown mascara only in the upper eyelash. Eyebrows: rub them with a pencil of the same color. Lips: use a dark red lipstick or pencil inclined to burgundy. – seafoam green and black low ankle boots by Acne.